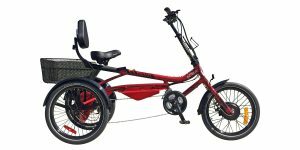 Electric Trikes tend to be popular with seniors and disabled individuals. 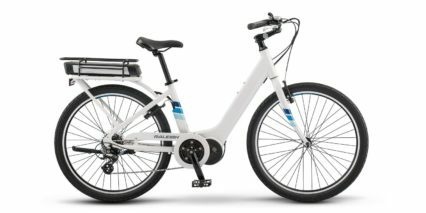 This is a vehicle type that allows you to get around town without having a license and does not require as much money or space as a golf cart… it also allows you to pedal along on sidewalks and paths that might otherwise be inappropriate for light electric vehicles, and in a way that keeps you safer and probably less stressed. 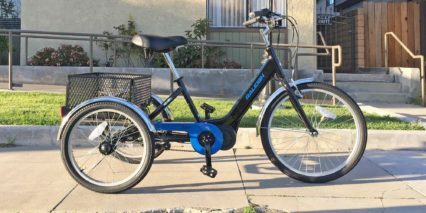 This technology provides freedom from using public transportation or relying on family and friends to get to and from the grocery store, the library, a lunch spot, or down to the park to enjoy the outdoors. 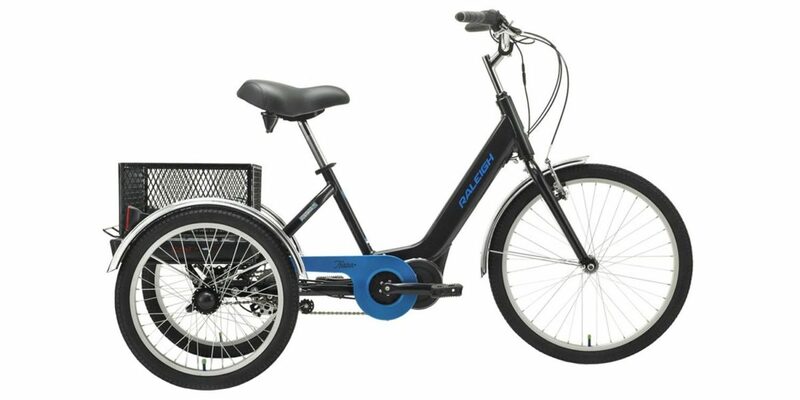 In most cases, e-trikes have a basket for hauling cargo and with the Raleigh Tristar iE you also get fenders and a chain cover to keep you dry and clean. These are Steel accessories which might rust if scratched, and they do rattle a bit, but they seemed sturdy and functional during my test ride. 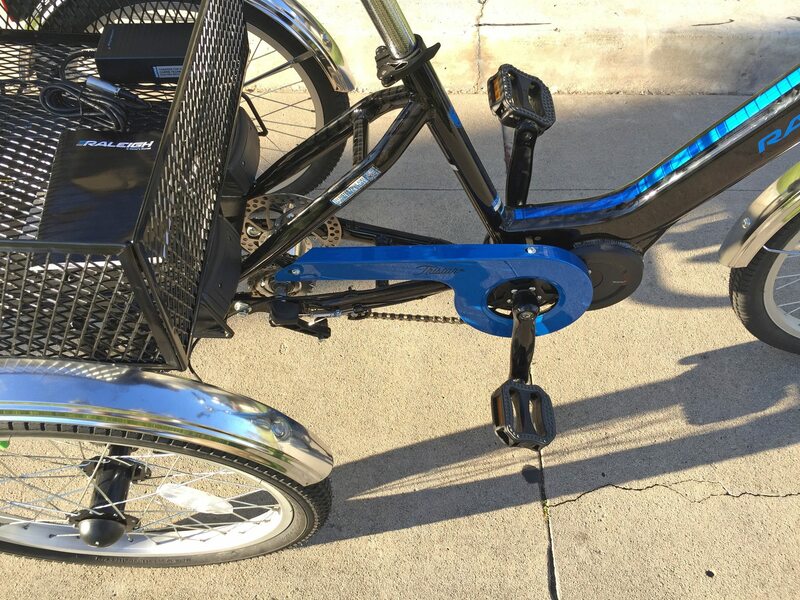 Furthermore, this trike is pre-wired for lights, so you could pay your local electric bike shop to add them and in turn, make it safer for early morning and late evening rides. 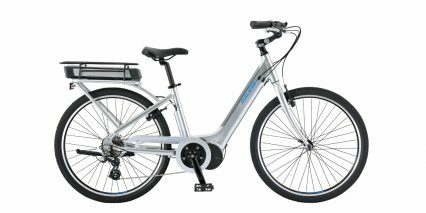 In short, the Raleigh Tristar iE is one of the fanciest electric trikes I have ever tested and reviewed. Most competing products try to stay under $1,000 but this thing costs $2,599! 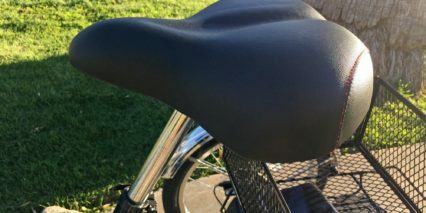 For that price, you get comfortable touch points like an extra-large saddle, soft rubber ergonomic grips, a swept-back handlebar, and some adjustability in how high the saddle and handlebar are positioned. While it only comes in one frame size, the lower step-thru frame is easy to mount and stable once you are on. 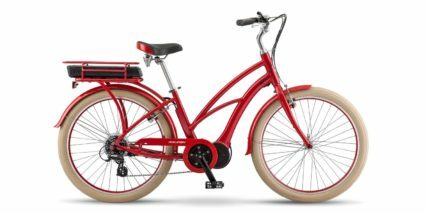 At stops and complete standstill, this tricycle won’t tip side to side the way that a traditional two-wheeled bicycle might, and it has locking brake levers so you can get off to load the basket without worrying about having it roll away. 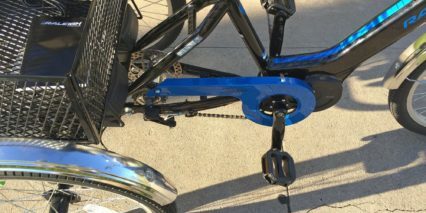 The classic black and blue color scheme is carried through to the fork and chain protector while silver accents give it a fancy shine, increasing your visual footprint. 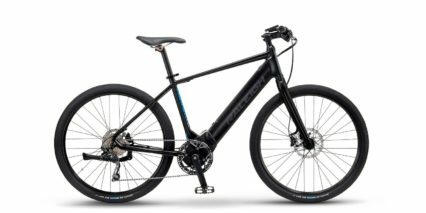 It offers hybrid tires with enough tread to grip packed Earth but still coasts smoothly and efficiently on paved surfaces. 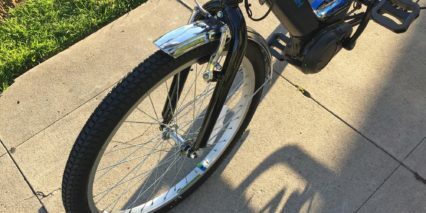 The larger 24″ front wheel is stable and soft while the smaller two 20″ rear wheels lower the battery bays and basket. Yes, this electric trike can accommodate two battery packs! But unfortunately, only the first one (on the left side) is wired in. So you’ll need to swap the packs in order to double your range, and a second battery can run $700+, so this is not a feature I would expect most users to take advantage of. My biggest complaint with the battery design is that you have to lean down and press a power button on the left side of the pack before each ride, and then press a second power button on the control pad to activate the display. 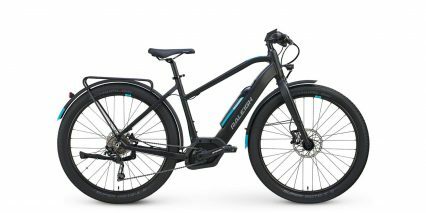 And so, while this is indeed one of the most feature-rich electric tricycles for adults that I have tested, it misses or fumbles on a few features that I find very useful. For one, it does not offer a throttle by default. 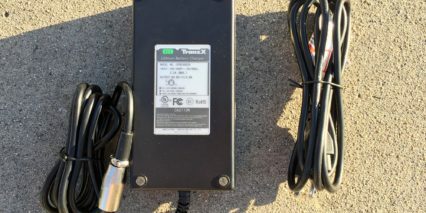 You have to pay extra for a little button pad and then have it installed… and in my experience, this throttle isn’t as easy to reach or comfortable to use for long distances. 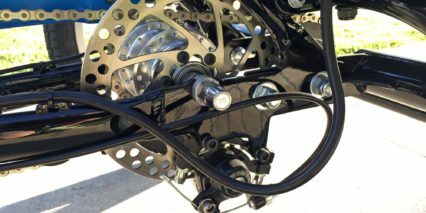 It’s not as dynamic as a variable speed trigger throttle or half-grip twist throttle. 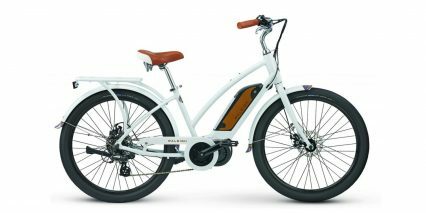 The thing is, a twist-throttle wouldn’t work on the right grip anyway because this electric trike has gears and uses a grip-shifter there. 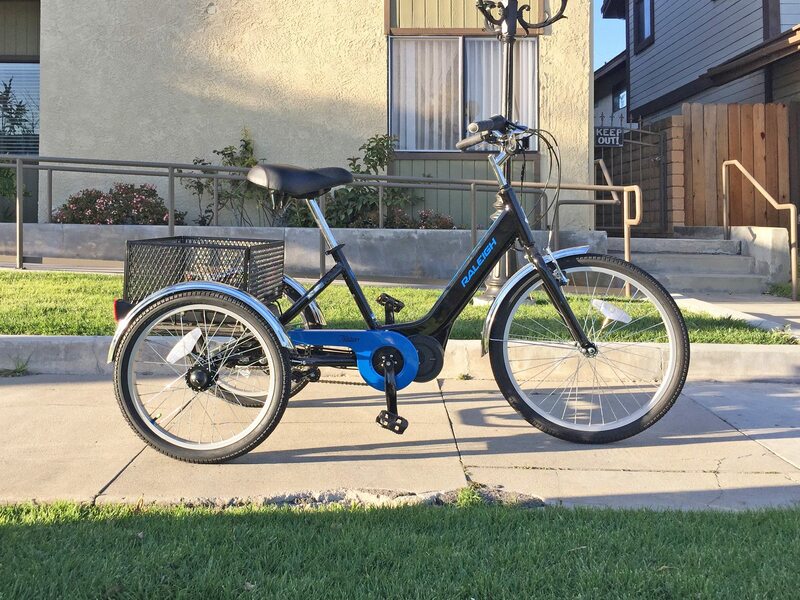 My friend Sam, from the Electric Bicycle Center in Fullerton California, helped me conduct this review because he sells this and other e-trikes, and he explained that many customers rely on throttle mode constantly when it comes to riding electric trikes. 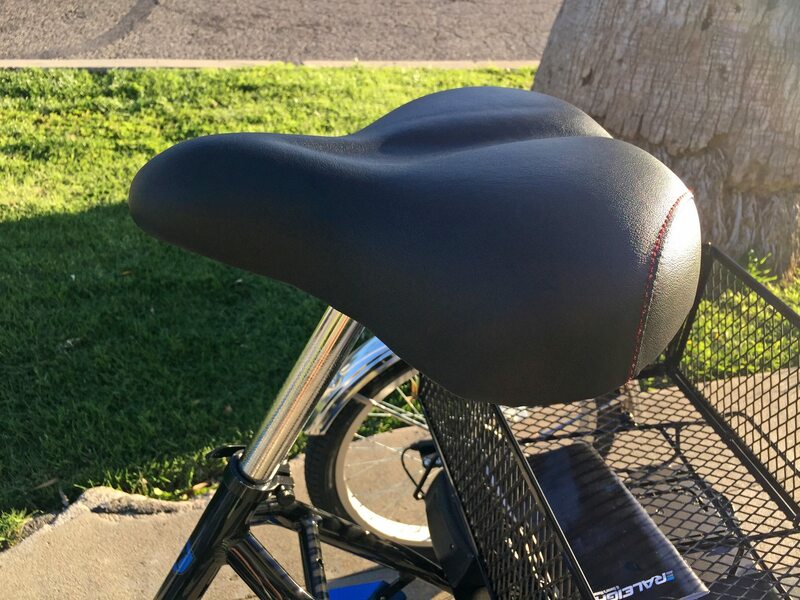 Pedaling on is usually not as efficient or comfortable with a setup like this because the seat tends to be lower for easy mounting, and the large saddles can chaff your thighs. 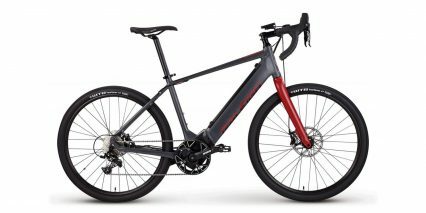 Whatever the case, at least you do get that three-speed internally geared hub, which can be shifted at standstill and should not have chain drop or maintenance issues as frequently as a traditional cassette and derailleur might. It’s actually a very good choice, but I’m not sure it’s as useful as a comfortable throttle. The motor is very powerful and efficient, it won’t spin the front wheel like so many other trikes because it turns the rear right wheel. Braking is strong if you have decent hand strength, the front linear pull brake is easy to actuate and the unique disc brake in the rear is protected well. 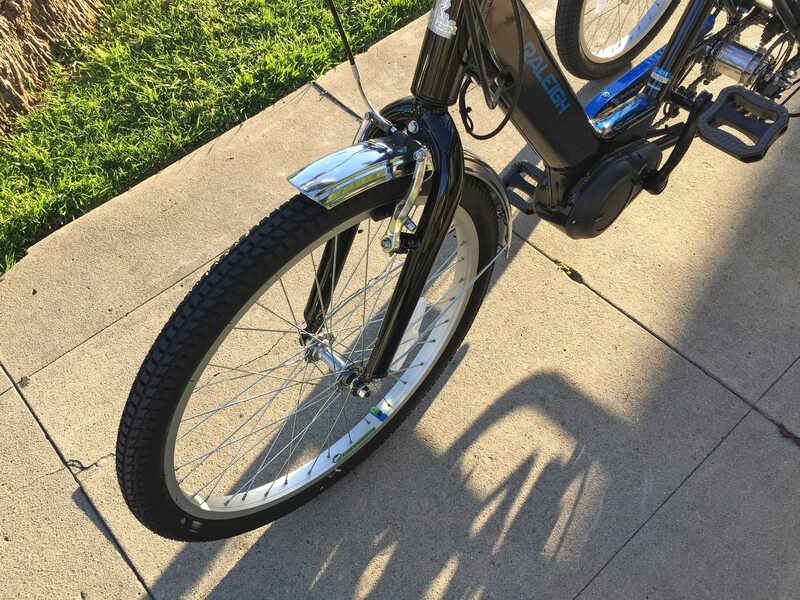 Interestingly, this trike allows you to pedal backwards instead of using a back-pedal coaster brake… which I enjoyed as a more advanced cyclist. The takeaway from all of this is that you need to be comfortable using your hands to brake vs. your legs and have enough hand strength to really control this thing. 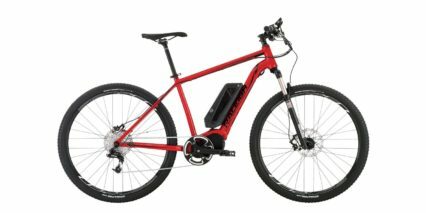 I personally think that hydraulic brakes would have been a fantastic option, especially at this price, because the levers are so much easier to pull and can even be adjusted to be closer for riders with small hands or those wearing gloves. 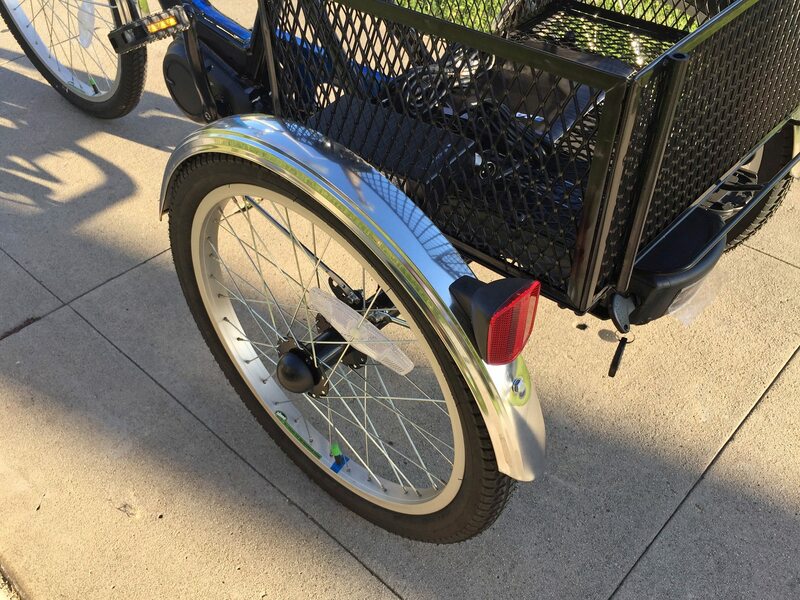 The dimensions on this trike make it easier to fit through standard sized doors and little plastic cups protect entryways and walls from deep gouges that bare axles and nuts might create. 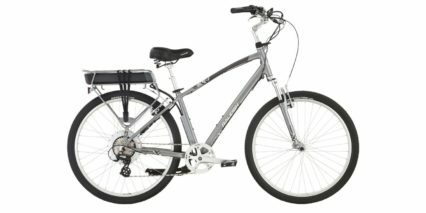 Weighing ~85 lbs, this is a heavy bike, but not as heavy as the cheaper products that often use Sealed Lead Acid batteries to reduce cost. 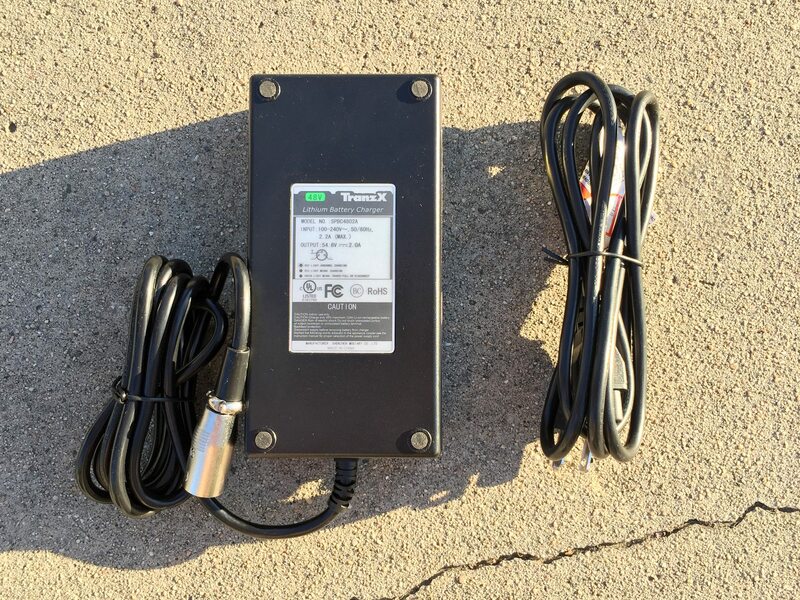 You can expect a much longer lifespan out of this battery and less sensitivity to improper care and storage. With an SLA battery, you need to keep it charged frequently but a Lithium-ion pack can go for months without use and should offer upwards of 1,000 full charge cycles vs. maybe 500. I have already touched on the battery and motor but I want to highlight a few things before making a conclusion. 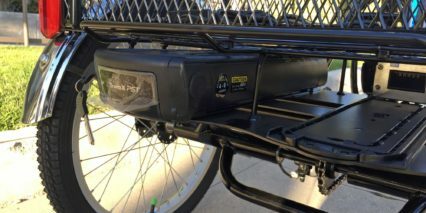 The battery pack has an integrated handle that makes it easier to pull out of the mounting slot and carry around without incident. Given how expensive these things are, it’s not a happy day if you accidentally drop it. 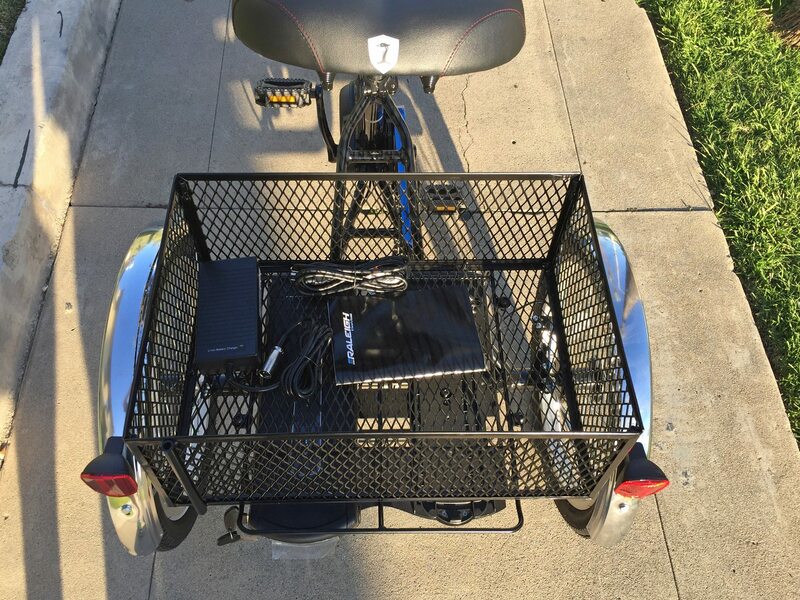 I love that you can charge the battery on or off the bike because that means you could top it off at a place of work or a friends house… or even store the trike outside permanently while bringing the battery inside for safe keeping. Weighing ~7.4 lbs, this pack is worth removing if you have to change a flat tire or transport the trike frame. Thankfully, Raleigh has put puncture protective sealant into all of the tire tubes to slow and self-seal leaks. Just make sure to check the air pressure occasionally and add a bit if you notice a leak… hopefully you can ride to a shop for some expert help on a flat fix and then ask for the same puncture protection or high-quality inner tubes again. 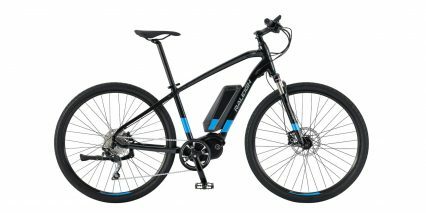 The motor takes advantage of what I would consider to be a more powerful and higher-capacity battery well because it’s a mid-drive. 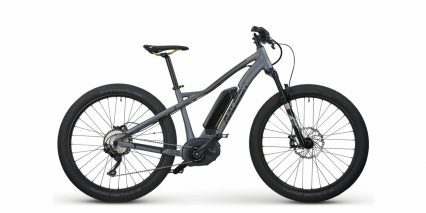 Rather than turning a wheel directly like a hub motor (which also adds weight and impacts steering if it’s a front-mounted motor), this thing keeps weight low and center on the frame and pulls the same chain drive that you do as you pedal. 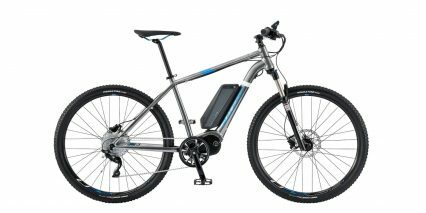 If you change to a lower gear for climbing, the motor gets a mechanical advantage and can thus expend less energy and help you ride further. It listens for your pedal cadence to know when to kick in, and to me, that’s a bit of a mixed choice. 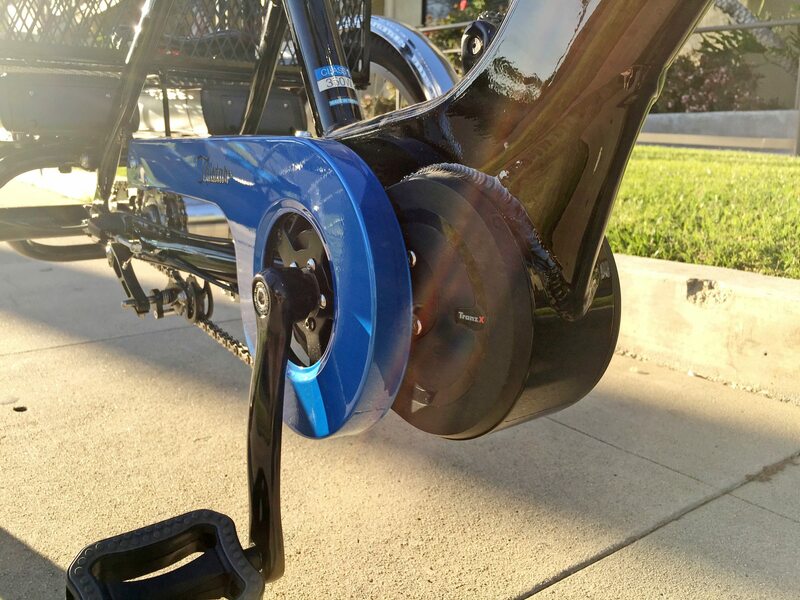 If you’re already moving, you can keep the motor going simply by turning the cranks… you don’t have to push hard. However, if you are stopped and just starting to go, I have found that it takes more effort and time to signal to the motor that you want help, because it’s not listening for torque. This wouldn’t be such an issue if you could just hit a throttle, and it may not be an issue for those who are willing to switch gears and pedal a bit, but the added weight of the trike and the comfort vs. efficient pedal position just isn’t as conducive to a cadence sensor as I would prefer. What should be a powerful, efficient, well balanced solution that is worth paying for, has become a bit inconvenient and cumbersome in practice in my opinion. 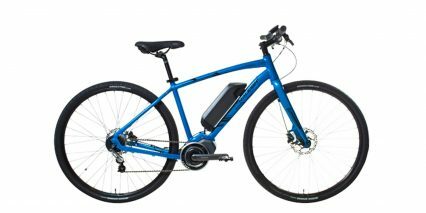 The bike is purpose-built with all of the cables being internally routed and the motor looks awesome and should last a long time… it’s just not setup the way I would have chosen based on what I hear about who uses trikes and how they prefer to ride. Note also, that the brake levers don’t have motor inhibitors built in, so if you accidentally keep pedaling while braking, the motor might be fighting you vs. stopping immediately. Operating the bike is a bit inconvenient, as mentioned earlier, because of the power button placement on the side of the battery case. not only is it low, I found that it was a bit tucked back behind a metal rack bar and under the basket. 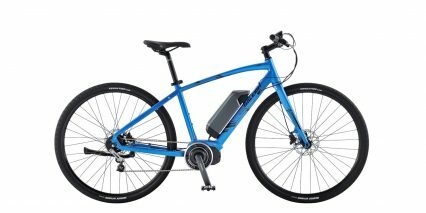 If electric trikes are aimed at older riders and those with stability challenges to begin with, I’m surprised that they didn’t make the battery more accessible. Even pulling it off of the bike to charge can be difficult because the tray is kind of tight (or at least the demo bike I tested was). I really wish I didn’t have so many complaints like this, but I think it’s important to explain that as fancy as the drive systems are and as high as the price is, there are some real trade-offs in how the product is actually used in real life. Once you power the pack on, it does stay active for a bit of time, so you could run into a store and come back with it still “primed” and then just press a power button on the control pad near the left grip. 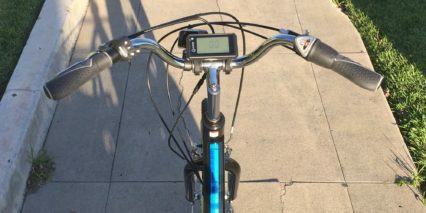 This pad has a plus and minus button that allow you to select from four levels of pedal assist. 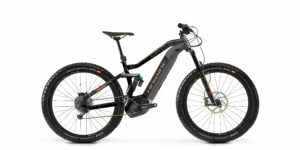 The higher levels raise power and allow you to reach the maximum assisted speed of ~15 mph. It’s a joy to ride this trike once you get going, the handling is quick and light and the weight of the motor and battery keep it stable… though you can still get it up onto two wheels if you really turn hard. The turning radius is super tight, making it easy to get around corners. Sam had suggested that new riders take some time riding in the lower two levels of assist, practicing figure eights in a safe driveway or parking lot. He suggested that you not put your feet down, no matter what, because they could get caught under the rear axle and basket and scrape you up or even cause an accident. It is recommended that you come to a complete stop before hopping on or off of this and almost any trike. To create the Tristar iE, it appears that Raleigh built onto their two-wheel Sprite iE. 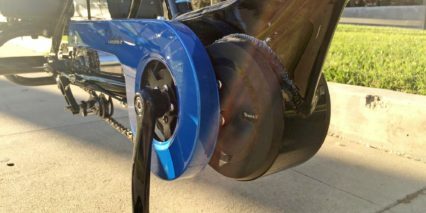 The result is a product that looks good, handles well, and benefits from a fancier mid-drive system and Lithium-ion battery combination that not many other trikes offer. 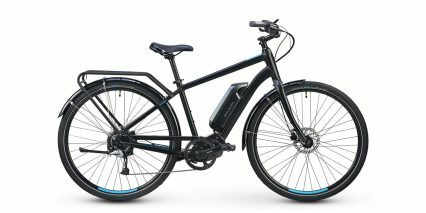 Sam said it’s one of his favorite e-trikes, but I have had a hard time overlooking the lack of a throttle, inconvenient power up sequence, and high price tag. I feel I have made those trade-offs abundantly clear at this point and I have listed many more considerations below. There really is a lot to like here as long as you’re okay pedaling or if you don’t mind the button throttle option. For me, this type of throttle lacks the smooth start that a variable speed throttle provides and is just positioned too far from the grip and ends up cramping my thumb, trying to hold it down constantly. That one little thing could be a deal killer. 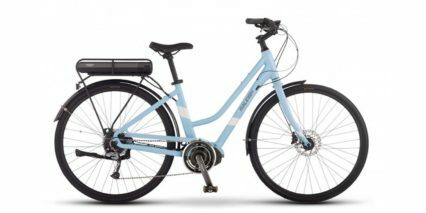 Sam also mentioned that this trike was difficult to assemble, and that might have been a nod to working with him or another dealer to get it done right, but Raleigh is now selling direct online and this could leave you trying to handle it yourself. I believe they do offer Beeline support (a mobile bike delivery/installation/repair service). 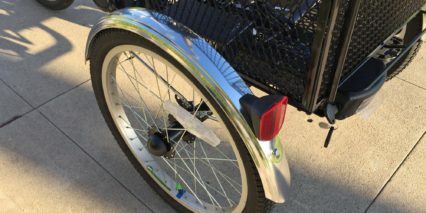 Even after you get the trike and have been using it, a flat tire could mean more effort than a traditional bicycle due to the weight and size… but that’s not unique to this trike. Whatever you decide, whichever trike works out, please take some time to practice riding in a safe space. Care for the battery by charging it regularly and storing it in a cool, dry location. Get to know your local bike shop so that you have a place to go for the inevitable flat fix and tuneup. 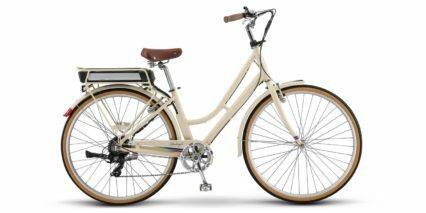 The Raleigh Tristar iE shouldn’t require much maintenance beyond tire tube repairs and brake pad replacement, and if you avoid stepping on the chainguard and don’t scratch the fenders, they should look nice for some time. My experience on this trike was fun, but my takeaway is a bit mixed… perhaps we will see some improvements or different options in the future. 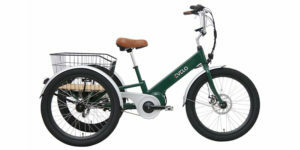 This is still one of the nicest purpose-built electrified trikes on the market, but nice is different from convenient. Most trikes I have tested just use linear pull brakes with rubber pads but the Tristar iE has a mechanical disc brake in the rear which could stay cleaner and require less service, I love that both brake levers have a brake lock pin so the trike won’t roll away when it’s parked or being loaded! Nice trike! If it is based on the Raleigh Sprite iE could it be fitted with that bike’s optional $50 boost button? 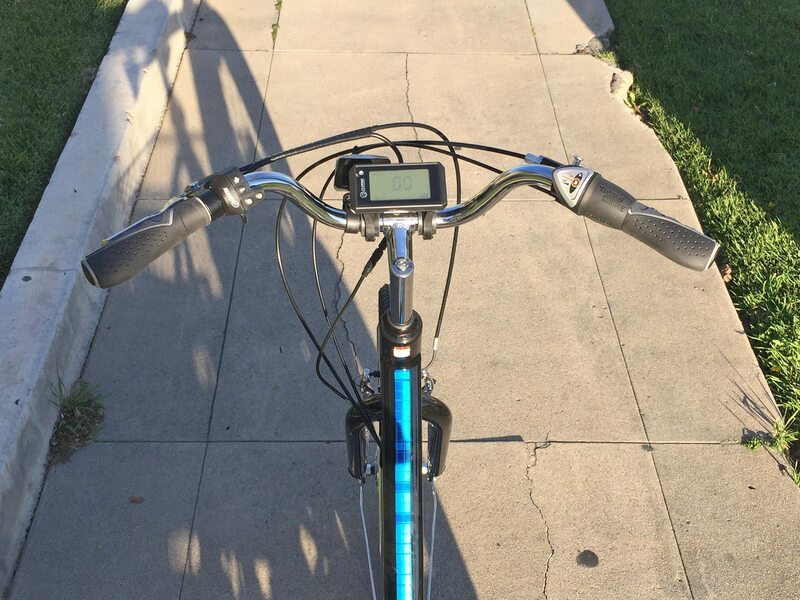 You mentioned the ability to pedal backwards was that just freewheeling or can you reverse in gear? 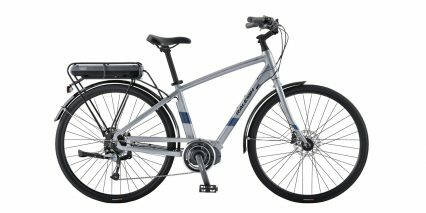 Worksman trikes have a direct drive hub motor that has a 3mph reverse gear but perhaps a mid-drive motor isn’t designed for that, not sure if it’s necessary if you could pedal backwards in gear? Court, something I think you missed is that powering up the trike from the handlebars does turn on and engage the battery. 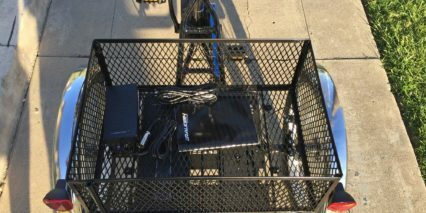 I had been powering up the battery as per your review but found that doing so had already turned on the e-trike’s console. Now, for the serious question. 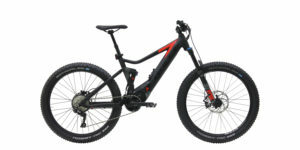 I found this trike to be a bone crusher on rocky, uneven dirt downhill paths. I did hit the thumb throttle and the brakes simultaneously more than once. Guess it’s simply years of motorcycling that says I’d much prefer a twist throttle. 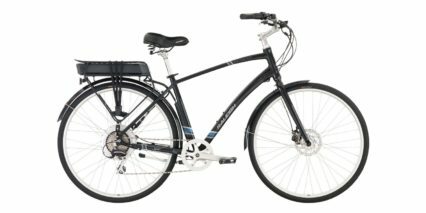 Can I have a Raleigh retrofit to a twist grip? Speaking of bone crushing. The total lack of suspension is a major bone, back and muscle killer. 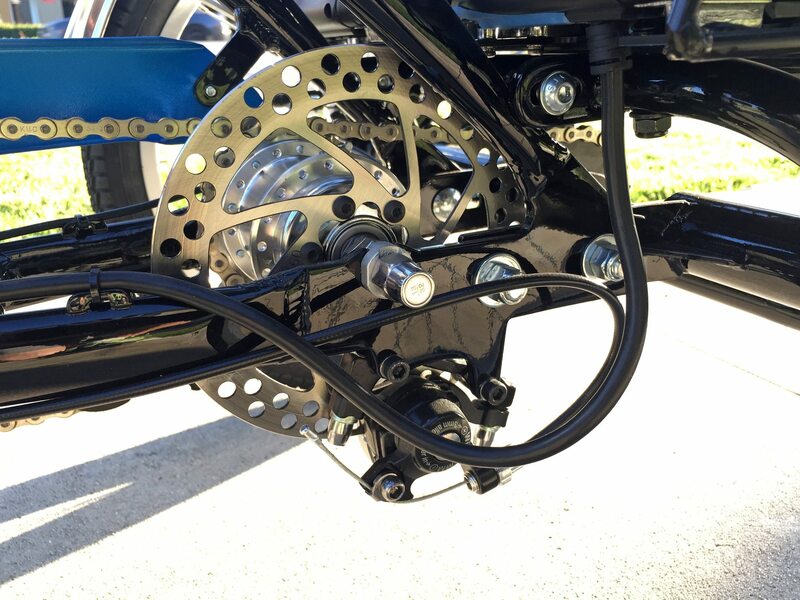 Can you think of retrofits for front and rear suspensions?? Lastly, this thing can truly benefit from hydraulic brakes. No, I’m not riding to or inside the grocers. I got this to go from my campsite to the main hall for talks or a dining hall. That’s always off road. Mostly grass but also dirt roads with ruts and hills. Lots of hills. Certainly appreciate the mid-drive but a 500w or even a 1000w would really, really help there. Any thoughts on retrofits/upgrades to any of the above? Suspension, brakes and motor. Thanks, Court. Sorry for the long delay in replying. I was heading on a trip when it came in, and my mobile device kept repeating every character I typed in the reply box. As for the battery power restart, my repeated tests were overnight and after a 3 hour stop for a conference. I was confident that it was able to start just from the display unit. Do you have model or specs and size for suspension seat post recommendations? 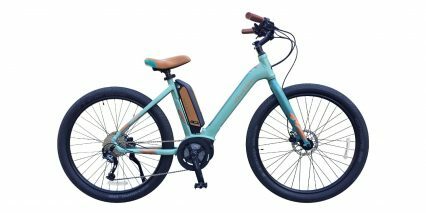 I wrote to Electric Bike Outfitters but have yet to receive a reply. I just asked for a plug and play twist grip replacement for the thumb throttle, not exactly what you suggested. I should have re-read your response. I also took the liberty of providing these questions as well as feedback directly to Raleigh. Not everyone wants or needs a concrete, paved riding surface under fair skies and no pot holes in a 3 wheeler serving only sunny California or Florida. 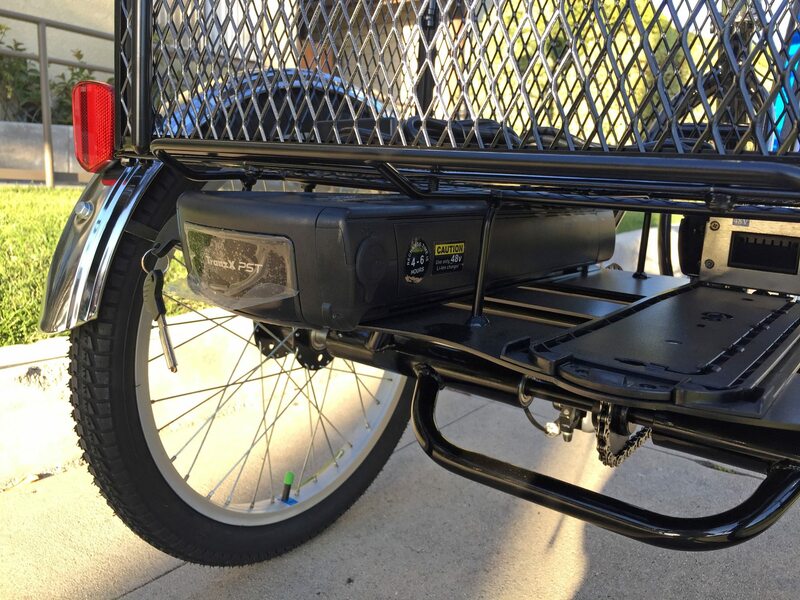 More options for riding for elderly, disabled and partially disabled adult riders for offroad use where middrive torque is required; campgrounds, hilly areas like parks or dare I say it, golf courses…. Never been on one and don’t intend to find out but I hear they have hills and sand areas. Not everyone has access to a golf cart. 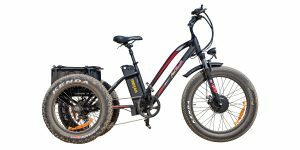 Bad examples perhaps, but the recumbent style trikes are inaccessible to the elderly and persons with disabilities, and the ones you’ve reviewed with rear hub or front hub drives aren’t practical for gravel roads with hills or even rocky roads with uneven pavement. Slip, sliding away! I suggested Raleigh make an offroad upgrade version of the TriStar IE. Can you think of anyone who has a Tranx upgrade with more power? Sometimes I was literally at my limit of ability to pedal because there wasn’t enough power to get through. 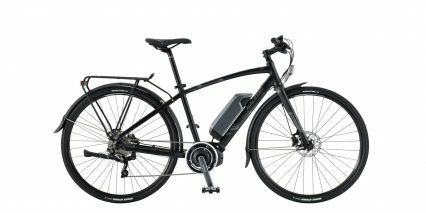 I like the option of that company Gates distributes you shared with the belt drive system and other power transfer systems.